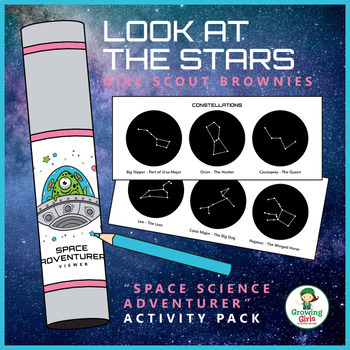 Brownies make constellation viewers by coloring their choice of three delightful space-themed wraps that they cut out and then tape onto empty paper towel tubes. 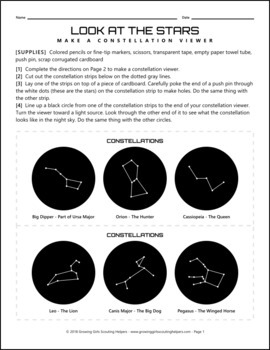 Afterward, they poke holes through the stars on the constellation strips, hold them up to the ends of their viewers, then turn their viewers toward a light source to view the constellations. 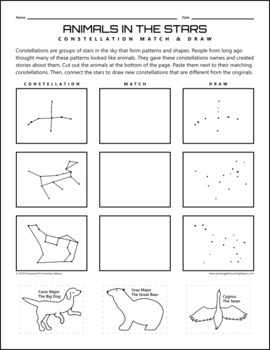 Brownies may also practice matching and drawing constellations with a captivating constellation activity sheet. 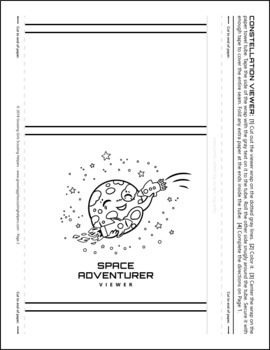 Look at the Stars fulfills Brownie Space Science Adventurer badge - Step 4. It may be worked within the troop setting or at home by a single girl with adult support. This printable activity pack includes two activities. Either one may be completed to fulfill Step 4 of the badge, or both may be used together for more extensive learning. Full directions are provided right on the activity sheets, so they are easy to send home with girls who miss the meeting. Be sure to download the preview for a closer look. Growing Girls Scouting Helpers is not affiliated with Girl Scouts of the USA. This product is not sponsored, endorsed, nor approved by, or in any way connected with Girl Scouts of the USA.